Professor Seichi Washida (2017) often rails against the centrality of face in Japanese perceptions of self (Watsuji. 2011). 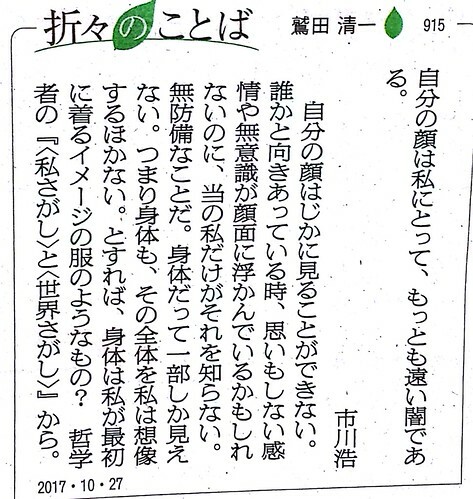 In this short piece on the front page of the Asahi Newspaper, Washida quotes Ichikawa Hiroshi, who in fact argues the unity of mind and body (Ichikawa, 1975) as saying that this face is that which is farthest from himself. I think perhaps Ichikawa draws a destinction between face, which can not be seen, and the body that can and the place in which it is perceived. Despite this fact, Washida does not distinguish between the body and face, and asks "is the body the first image clothes I wear perhaps?" This metaphor relating the body with clothing can be use to theorize superheroes who are light (Ultraman) or their clothes (Sentai/Power Rangers, Kamen/ Masked riders, Gundam, Eva, and Iron Man). Japanese people, as they become Japanese, grow into their clothes. Professor Washida remains unconvinced. Watsuji, T. (2011). Mask and Persona. Japan Studies Review, 15, 147–155.